Yesternight was the Friday Night Games and the BB Naija housemates were ready to bring their A game but at the end Miracle scooped another victory during the Arena Games after winning Head of House and the wager this week. As the weeks go by, Big Brother increased the game’s difficulties, this time adding no less than five challenges for the housemates to complete in a record ten minutes. Big Brother had designed the game for housemates to make the best use of speed, agility and balance under pressure. The obstacle course kept ascending, from the relatively simple one of walking on a balance beam, to running on platforms, then pushing a wheelbarrow which gave rise to a few memorable funny faces from housemates. The next level included climbing up and over a net obstacle before crawling under a net that landed into an air mattress covered in flour and feathers. Nothing stopped housemates from giving their best to the game. Even Nina and Lolu who had what could be described as a slippery time on the balance beam, picked themselves up really quickly and started all over again with a renewed determination.Covered in flour and feathers on the chin, face, hair, nostrils, knees and skin, exhilarated housemates were relieved that Big Brother ordered them to go take a shower. Perhaps they may even feel a little bit grateful for Biggie’s gruelling morning fitness routines that have paid off. 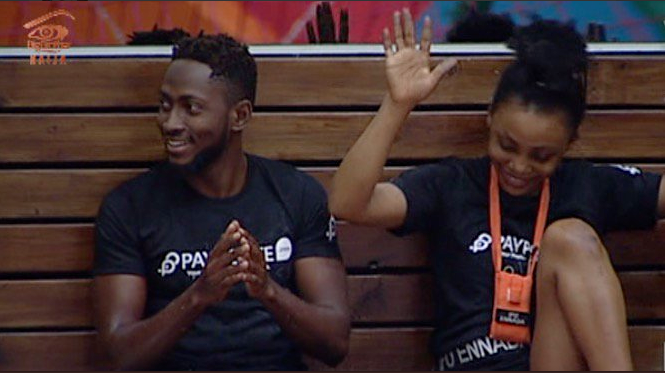 From the side benches where he was seated, Miracle seemed to be riding the wave of his third success, as he was applauded by all upon Big Brother’s announcement of the winner.